[Area Reconnaissance], which in total formed eight different versions. 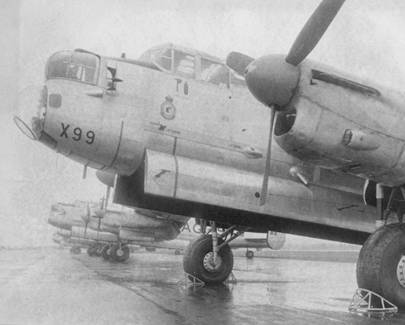 The 10MR or Maritime Reconnaissance modification was produced in greater numbers  than any others, and over half of these modifications were sub-contracted to de Havilland in Ontario. Fairey Aviation in Nova Scotia modified the remaining Mk. 10 MR aircraft, including KB999. After modification KB999 began service with the newly formed [31 May 1950] No. 405 [Eagle] Squadron based at Greenwood, Nova Scotia. The aircraft was known as “triple nine” by the crewmembers and received the international morse code letters VCAGX. VC [Victor Charlie identified her as Canadian], A [Alpha as Air Force], G [George for 405 Sqn. ], and X [X-ray for serial 999]. Lancaster KB999, ex-Malton Mike flew routine reconnaissance patrols on the East Coast of Canada until Sat. 22 August 1953. Due to mechanical problems on a No. 408 Squadron Lancaster, triple nine and crew of eight were ordered as a replacement and dispatched from Greenwood, Nova Scotia, to Rockcliffe, Ontario. No. 408 Squadron were conducting classified aerial photography [Russian Ice Stations] and gathering air samples over the Arctic region from Cold War Russian Hydrogen bomb test fall-out. Upon landing at Rockcliffe a special air filter was attached to each side of the Lancaster nose. The crew were then briefed to fly in front of and parallel to a huge storm system but to stay out of the cloud as moisture would neutralize the samples. The flight plan took them from Rockcliffe northwest to a point over James Bay, over Hudson Bay and then a turn west at Chesterfield Inlet, a zigzag course to get air samples and then south to Churchill and recovery. Story from crewmembers interview of Frank De Baie and Gordon Duguid. The first half of the flight plan was completed as briefed, air samples were obtained and the crew now sat back for the flight to Churchill for fuel. 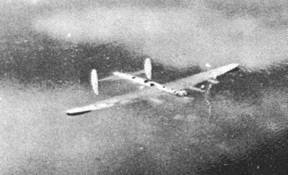 The Lancaster was flying at 20,000 feet altitude and the crews were on oxygen. Suddenly the rapidly approaching frontal system was upon them, cloud above the aircraft, electrical storm, heavy rain and gale force winds below. At the [ETA] estimated time of arrival for Churchill, approx. 11:15 pm, the Captain descended into the storm to 1,800 ft [ASL] above sea level. 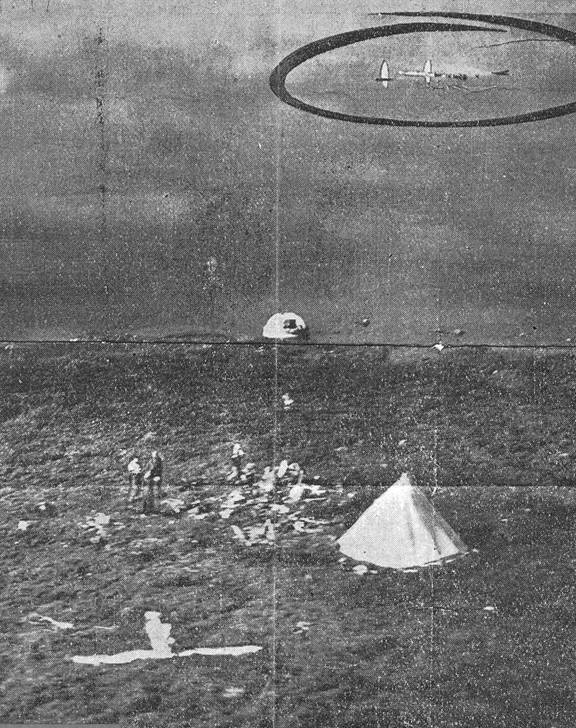 Unknown to the crew the Captain had not established his correct position for three hours before his descent even though astro conditions prevailed. The aircraft now flew in and out of low cloud, as heavy sleet fell on the flat terrain dotted with hundreds of lakes. A very weak [RR] radio range signal was being received but was far too weak to home onto. The crew now began to realize they were lost. Five minutes past the ETA, the Captain thought he was too far south and turned into a northerly heading. After eight minutes a north–east course was established with intention of picking up the Hudson Bay coastline. The Captain then asks the radar operator if he could find the correct position by using H2S radar. He was told this was impossible as they were flying low level with no shoreline to get a true fix. They continued to fly over unknown terrain maintaining [VFR] visual flight rules. The last radio message was sent to Churchill at 11:25 pm, when the Captain asks if he could be guided in by radar. The answer was “no”. The lost Lancaster KB999 had been the object of a search by fifteen Lancaster aircraft and four Dakota, which covered 100,000 square miles. S/L Jack Hudson and crew were flying in Dakota #568 when they spotted the sun’s rays reflected from the mirror held by F/ O Terry Staners. Later that day, an Otter aircraft equipped with floats and flown by F/O L.G. Denman of Toronto, made a hazardous landing on the mile-long lake. 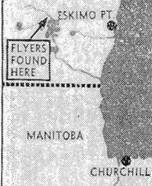 Today Malton Mike remains at the bottom of the unnamed 40-foot deep lake, 192 miles northwest of Churchill, Manitoba. The photo taken by RCAF Sat. 29 August 1953 –the lost are found, KB999 in lake. The “lucky” crew of X999, at Churchill, Manitoba, hospital - 30 August 1953. F/O J.A. Murray, F/O Wally Grbac, F/O Bill Morton, F/O Gordon Duguid, Pilot – F/O Terry Stamers, and LAC D. H. Wentzell.